Yesterday, another attack near Rhodes Memorial!!! TMSAG elected to drop the TM Safety Forum this week – and to go back to relying on its own sources and networks for information about incidents of crime in the Table Mountain National Park. 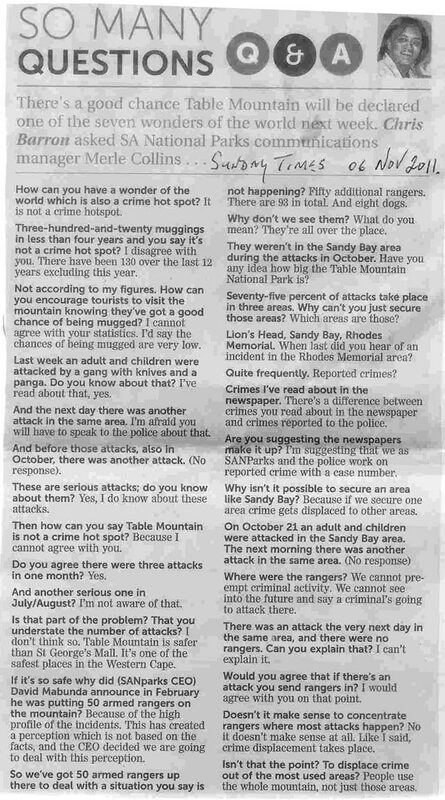 Earlier this week – after I asked the chairman of the TM Safety Forum why we (TMSAG) had received no information at all from either SAPS/TMNP about 3 attacks in the Sandy Bay area during October – he responded to say that we should approach these organisations directly and to ‘stop using the forum as a stepping stone’. I decided at that point that we were better off looking after ourselves as mountain users. What good is the forum then? Earlier this year, on two separate occasions during formal Safety Forum meetings, we were explicitly informed by TMNP that TMSAG would receive *no information whatsoever from them*. We decided to hang in there despite our major goal being compromised at that point already. 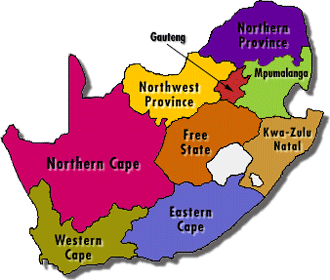 We even went so far as to establish Table Mountain Watch and to offer it to the forum. It was used once only and then never again. I refer you all to page 5 of today’s Sunday Times Review Section, where Merle Collins (Communications Manager of TMNP) is questioned by Chris Barron. I rest my case. Folks, as mountain visitors we are at risk. There is enough evidence of this to convince even the toughest judge. Are TMNP doing enough to keep us all as safe as possible? This is the crux. We believe not, because “Forewarned is Forearmed” and without any form of reliable and sustainable information provision – immediately these attacks occur – we should not and cannot expect to enter these areas safely. Do we go into the sea when the flag is up? Many of you have come a long way with us. Now is the time to decide one way or the other whether this issue is serious enough to make a noise or whether we should accept 50 armed rangers on the mountain and the closure of 2 main access points to the mountain at night. Never mind the mind boggling denial on behalf of TMNP that there even is a problem. Consult your local Ward representative. TMSAG will carry on alerting and informing people as best we can and as soon as we can. Two male trail runners attacked late Sunday morning above Rhodes memorial. Two black males seen running away down the tar road towards Newlands. Patients extracted by Wilderness Search and Rescue, with Metro and Parks. On the one hand you have people being (regularly) attacked and mugged (with seemingly very little being done to combat it) and then there is the campaign (below) to get more people on the mountain! Table Mountain would see a surge of tourism if named one of the New Seven Wonders of Nature, Western Cape tourism MEC Alan Winde said on Monday. “If Table Mountain becomes one of the New Seven Wonders of Nature, tourism to our destination could increase by 20 percent,” Winde predicted. Justin, you took the words right out of my mouth. Yip, come hither rich tourists, and we’ll pick you dry. Sorry my beautiful mountain, but I can’t vote for you until you are free of muggers and litterers. If that was a test I would have given Merle Collins a GG. The only way the mountain can be kept safe is if the muggers get nothing from their muggings. So PLEASE educate the public not to carry cameras, jewellery, wallets and what-have-you. In fact, anyone who is mugged and reports loss of such expensive items should be fined for making muggings a worthwhile enterprise on our mountain. How on earth can any police force patrol the mountain to ensure everybody is safe? Just keep the muggers off by making it NOT worth their while to go there.